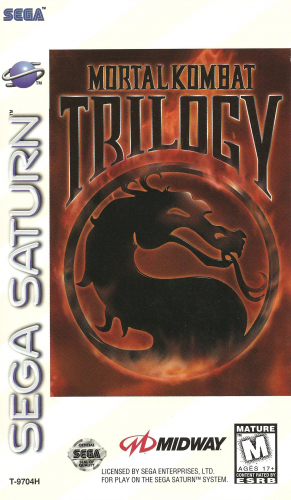 MORTAL KOMBAT TRILOGY brings the whole MORTAL KOMBAT universe to the Sega Saturn. Die-hard fans of the series will go krazy over all-new finishing moves and a new secret character: Chameleon. In addition to the multitude of great-looking backgrounds and digitized characters, MORTAL KOMBAT TRILOGY also includes more options, as players can do more than change the difficulty and toggle the violence mode; a new feature called "auto" combos can be used, which make the standard multi-button attacks much easier to pull off.